In an earlier article I already described a number of Envoke IT freeware tools. In the meantime they created again a few nice tools. So time again to take a look at their new tools. EnvokeIT adjusted the VBS script of the Flex Framework that takes care off the logon and logoff processes so the Flex EnvokeIT logger functionality is enabled. Therefore you only need to copy this new VBS script (Flex_Envokeit_Logger_Framework.vbs) into the folder where installed the Flex Profile Kit files on your Terminal Servers. Also your scripts should be adjusted so the new VBS will be started in stead off the original Flex_Framework.vbs. Within the VBS the default location for the log files is in the storeroot configuration of the Flex Profile Kit configuration, but can be changed easily within the VBS. For example you should configure an additional share so your helpdesk only need to look up the file on one location. Below you will find an example of a log file from a logon. EnvokeIT also has an executable so you can view these logfile using a graphical interface. This tool is a good addition to the Flex Profile Kit which gives a good overview of actions and very useful for troubleshooting issues. With WIInfo you can show some additional information on the Web Interface pages, so your helpdesk can easily identify to which web interface the use is logged on client name, client IP and ICA client version. Adding this information within your Web Interface is done via an adjustment of the default.aspx. EnvokeIT delivers an already modified version of default.aspx for Web Interface 4.2 into their package. 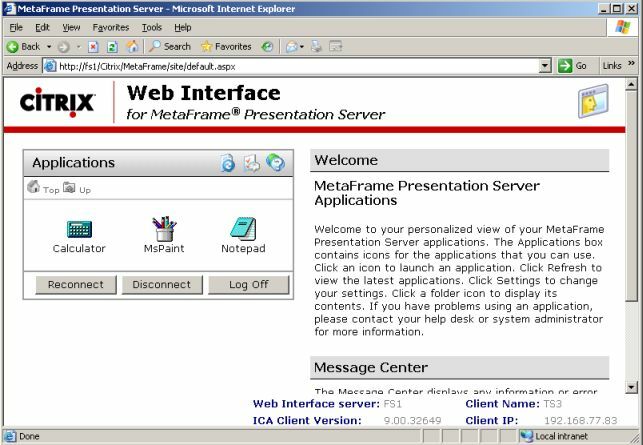 So if you are using Web Interface 4.2 you only need to copy the three files out of the zipfile into the Citrix\Metaframe\Site folder within the InetPub directory. If the user is logged on at the bottom of the Web Interface the earlier mentioned information is displayed. If you have multi monitor configurations you probably have stumbled across the problem that the published application starts in the “middle” of the monitors. So the application starts half on the left monitor and the other part is available on the right monitor. Although it is not that hard to move the application to the one monitor, but there are much complaints from users about this behavior. Therefore EnvokeIT WindowManager developed WindowManager. With this tool it is possible (in combination with a script) to position the application on a specified location. You need to specify the form and the coordinates for that application. To find out the form name easily EnvokeIT has additional tool called WindowsDisplayer. Because I do not have a multiple monitor configuration I can not test this tool, but I thought is was worth mentioning into this article. Again EnvokeIT developed some pretty nice tool, which are easy to implement and useful. This time there are mainly based to support you or your helpdesk with troubleshooting issues or a very specific target with the multi monitor support. Especially with the Flex Framework logging component they developed a tool that is probably on the wish list of many Flex Profile Kit users. The EnvokeIT tools can be downloaded here.